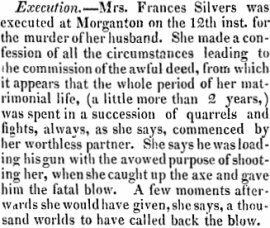 On this date in 1833, a young woman named Frankie Silver was hanged in Morganton, North Carolina for murdering her husband Charles. Silver is a staple of North Carolina folklore, supposed to have assassinated her spouse in a jealous rage and checked out singing her confession from the gallows. But the reality, as best one can discern from the distance of time, is quite a bit murkier; indeed, quite a bit more dark and dramatic. Executed Today is honored to mark the occasion by interviewing author Perry Deane Young. 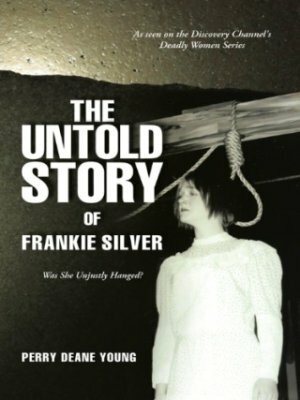 Young’s acclaimed The Untold Story of Frankie Silver: Was She Unjustly Hanged? debunks many of the fables surrounding this old time true crime. ET: Just by way of orientation, what’s the baseline legend of Frankie Silver that Appalachian children learn? And how exactly did this particular hanging come to be so richly preserved in ballads and folklore and the like? PDY: The legend is that this true story was the basis for the black blues song, Frankie and Johnny. Frankie killed her man out of revenge cause he done her wrong. The legend is that she was the first — or only white — woman ever hanged in North Carolina, that she sang a confession from the scaffold. This was the story I heard as a child; only later would I learn that none of this was based on facts. Most historians now think the song, Frankie and Johnny, was based on a murder in St. Louis, although several folklore collections published in the 20th century say it was based on Frankie and Charlie Silver. What is it that drew you to this case in the first place? Most people’s mothers tell them stories about Winnie the Pooh and, oh my, Tigger the tiger. My mother told me about a woman who cut her husband’s head off with an axe and burned his body in the fireplace. As a writer, I’ve always been grateful for that. Your book makes the case that she was wrongly executed, and not only that — but that “the true story, the facts … are even more interesting than the story as it has been passed down by so many ballad singers, folklore specialists, storytellers and newspaper columnists”. What’s the most important misconception people have about Frankie Silver? What surprises you most about the story? There are many misconceptions, starting with the murder itself. There is ample evidence from the time to prove that her husband was loading his gun to kill Frankie and she picked up the axe to defend herself. She did not sneak up on him as he lay sleeping; she killed in self defense. She was not the first or only woman ever hanged in North Carolina, she was one of at least 15. She did not read or sing a confession from the scaffold. 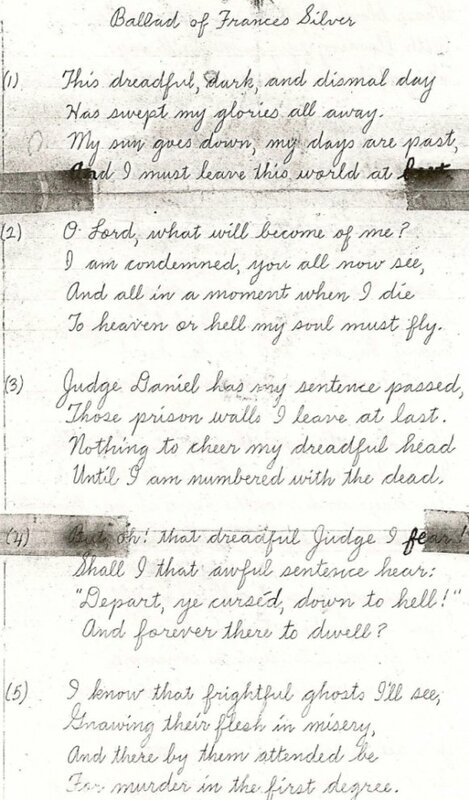 A young school teacher plagiarized a Kentucky ballad, “Beacham’s Lament,” had it printed and handed out at the hanging. It is this ballad, in which Frankie laments her guilt, that has come down as factual. However, when I was a college student, I came across 17 different letters and petitions to the governor asking for a pardon for Frankie. In these documents, it is clearly spelled out that Charlie Silver was a drunk, abusive husband and Frankie killed him in self-defense. Hindsight is 20/20, of course … but it doesn’t seem to require hindsight to think that her lawyer would have been expected to introduce evidence of domestic violence even if that wasn’t the main thrust of his defense. Would it also have seemed that way to the reasonable barrister in the 1830s, or was there good reason for him to avoid it? Can we say that she was hanged for poor lawyering? The late Sen. Sam Ervin was, like me, a great believer in Frankie’s innocence. 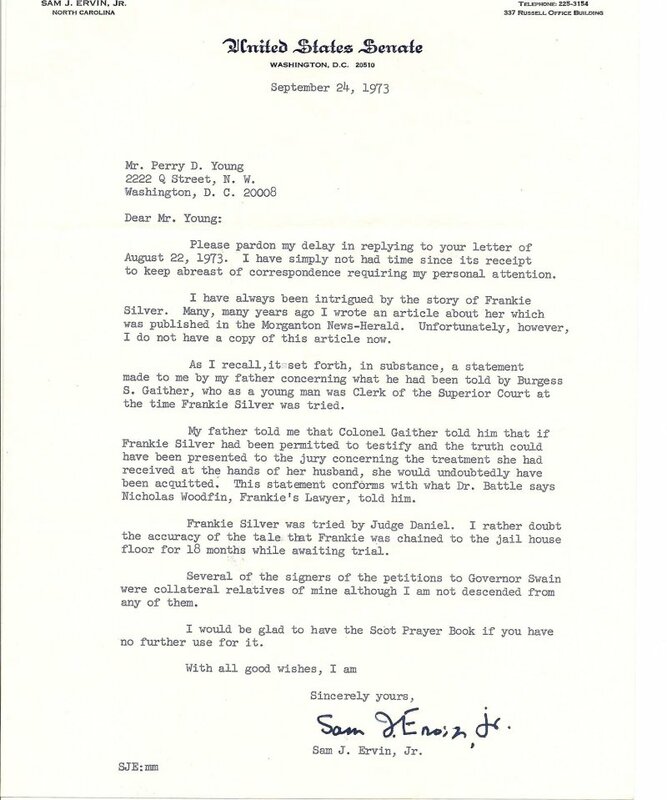 A letter he wrote me explaining why is reproduced in the new edition of my book. He explained to me that at the time she was tried, the accused was deemed an incompetent witness and could not take the stand in her own defense. The law was changed in North Carolina in 1859 so that, as now, you can choose to defend yourself but you still cannot be compelled to testify against yourself. Frankie’s lawyer, perhaps at the insistence of Frankie’s father, pleaded innocence. In other words, he could not introduce evidence of extenuating circumstances such as spousal abuse if he was saying she didn’t do it in the first place. In the book, I note that a man named Reuben Southard beat his wife to death that same year in the same county and got off with court costs. In one of the petitions, Frankie’s neighbors assert that it has often happened that a man murdered his wife with no legal consequences. In an article for his local newspaper, Ervin blamed Frankie’s lawyer for the outcome of the trial, not realizing that her lawyer was his own great great uncle. Over the longer arc, it’s surprising to me that the claim by a woman who killed her husband that he was an abusive spouse — especially if that claim attracted a lot of support at the time — would go underground in the historical recollection of the case. In its essentials, this is one of the stock templates we have for thinking about a domestic crime. What happened in Morganton, and with the families’ descendants, over the years to shape the popular memory of the event? And does it suggest any larger lessons to you about the way we construct our histories? The explanation is quite simple. All that survived over the years was this ridiculous “ballad,” in which Frankie confessed her guilt. She had nothing to do with that ballad. But, in fact, she did write out a confession. The confession itself has never been found but we know from other sources that it explained that she killed in self defense. The documents that detailed Charlie’s abuse and other details about the case remained hidden in the governors’ papers in the North Carolina Archives until I discovered them in 1963 when I was a student at the University of North Carolina at Chapel Hill. In 2001, Frankie was finally allowed to have her say in a play which I wrote with William Gregg and which was produced by the Southern Appalachian Repertory Theatre in August 2001. Compounding the historical image of Frankie has been the fact that her family was ashamed of having a convicted murderer in their midst. It was Charlie’s family that became the keeper of the legend and all its misconceptions. The Silvers kept alive the fake ballad “confession” and did everything they could to preserve the image of Charlie as a faithful husband who was killed by a spiteful wife. Do you find that here in 2012, there are still people whose oxen are gored if your research contradicts their own version of the story — especially if you present Charlie as a violent husband? You betcha! The Silvers to this day are rather vehement in defense of their Charlie. It was a historic moment when I was invited to speak in the old church house near the murder scene for the Silver family reunion. In the basement of the church, they have created an extraordinary archive on the murder story and the family in general. You’re working on a program for Discovery channel’s “Deadly Women”. Does it hold any new revelations about this intriguing historical case? And that bit about her getting a gun .. or even CONFESSING is a LIE! SHe NEVER EVER confessed to it.. She lied from the moment he was gone to the moment her neck broke. Not one time did she ever utter any different or any self defense action. What we do know and have evidence of, is her lies, her covering up, the murdered disembowled body, burning him piece by piece and even showing lack of respect if he ever came home again. She was caught in such lies and evil vileness that if she did testitfy she would just further purger herself. Due to her lies, she was not to be trusted. Her dad got up a writ to get his wife out and his son for being illegally held yet he did not get one for her.. HUMMMM… makes one wonder why he didnt if she was not guilty!! Abuse does not give reason for sinkin an ax into his head. And if I was abused I would not have stuck around waiting to see if he got up or to cut him up.. I would have gotten myself to the sheriff! i would not have been quiet and futhering my guilt by breaking out of jail.. I would not have lied about where he went.. Or done the hacking and burning. WOULD YOU? NO! You wouldnt have.. And it happened to be just after the CHristmas wood was all chopped and stacked for the holiday week! However, she forgot about the pungeon Floor. Trying to make people think he left her for good, cleaned the whole place up even chippin off where blood had splattered on the mantel. There his blood dripped between those log floors onto the fresh untouched ground under the cabin floor. Charlies Blood testified on his behalf and told the whole story of how she tried to get people to think he had left her coldly!! Yet she got caught in it. DO NOT believe the crazy sympathizers and lies about her being abused.. She did not act at anytime as if she was abused, nor did she say she was, nor did anyone else give any testimony of it.. SHe was a beautlful girl and many was bewitched by her BRIGHT EYES! AMPLE evidence he was loading his gun! LIES! No where are there ANY evidence or were there any ever given of her being a battered wife or him going for his gun! That lie was printed up in newspapers years after the hanging.. They wanted to capitalize on the murder to sell papers! I live in Mitchell County, North Carolina and have been to the little white church in Kona, NC. As a photographer I certainly captured the scenery of this place that is holding secrets of histor. I am intrigued by the evolution of history through ballads. Being that I am Scottish, as my grandmother was a McCurry, ballads are a part of being Scottish as much as anything. Many settlers in this part of Western North Carolina are Scottish. Even the Scottish Highland Games are help on Grandfather Mountain each year. I heard a story on NPR that made is sound a matter of fact that the story of Frankie and Johnnie was about the couple in St. Louis and the story here in NC was never mentioned, unfortunately. I very much look forward to a movie on this topic and hope real facts will prevail, as I am still perplexed about St. Louis and NC in regards to this couple. I would be glad to share my pictures and contribute in anyway to the docmenting of history, that I am told took place right here in my “back yard”, of NC. Pleasure finding you and your writing. Why is she referred to as Frankie Silver instead of Silvers like all of the articles from the times and on her grave marker? May seem silly but I was just curious. And the Deadly Women episode still had some of the untrue facts. The Silver family hated the S put on the end of their name. People telling the story would put the S on there and the writers of the newspapers thought it had an S.. My mother who is a direct decendant of Charles Silver, remembers her G, G, Grandfather get upset whenever someone did so. He would come and tell about the murder to the family when he visited. He got his information from Charles’s half brother Albert since he was a teen when he was murdered. Thats as close as your gonna get to talking to people who lived through it. Thanks for this! I first heard about Frankie from Sharyn McCrumb’s book (“The Ballad of Frankie Silver”), which is quite sympathetic to her; it was surprising, after reading that and feeling that I knew the story well, to see web sites that painted her as a vicious, heartless murderess. Thank you for the story – and for the information about the book. I shall be buying this! Thanks, J!